I’ve had the honour of modelling for Edinburgh-based designer womenswear boutique Jane Davidson for years. This month saw their spring fashion show, an edit of their key items for the season and a special Spring beauty presentation from luxury cosmetics brand By Terry. Making sure their clients were refreshed and ready to step into the new season from their wardrobes to their makeup bags. 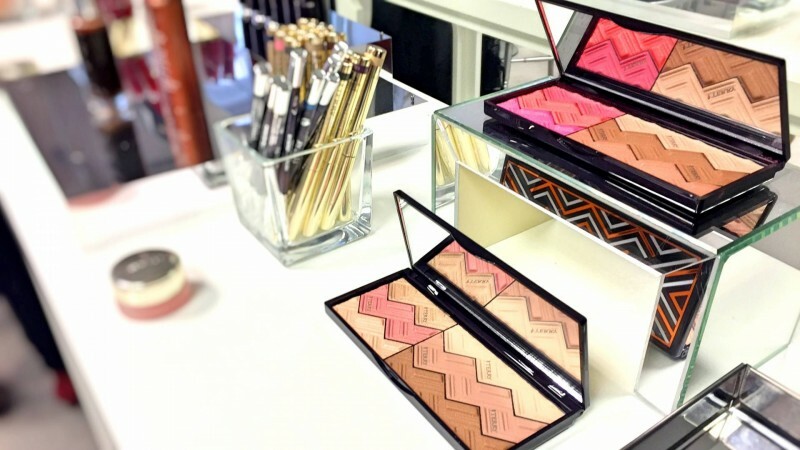 By Terry is a pioneering makeup range from one of the beauty industry’s most respected creatives. Terry de Ginzburg is the woman who inspired and developed YSL’s colour range, following which she opened her own beauty lab and created By Terry. I love the philosophy behind the brand; Skincare with colour. Created to enhance, not mask, natural beauty. Skin friendly formulas with flattering colours to make you look like YOU but on a great day. 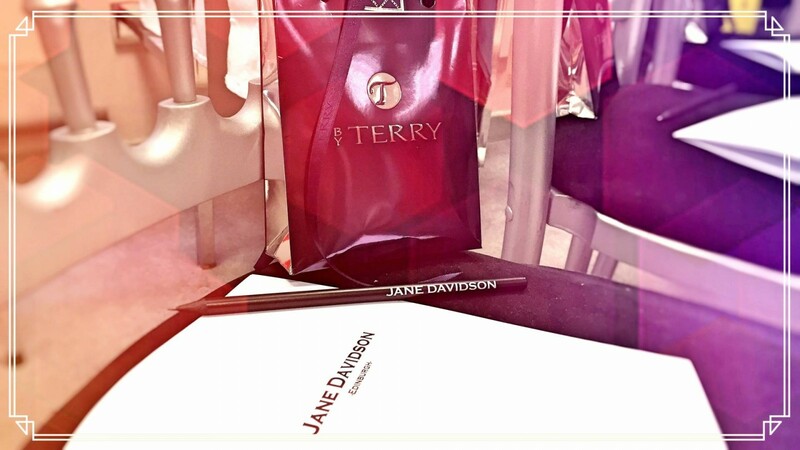 By Terry’s national makeup artist Lesley and Ros from SpaceNK Edinburgh were on hand at Jane Davidson giving a spring/summer beauty presentation. With a wealth of experience in the beauty industry, the ladies introduced us to some of their top products to give you that glowing, step-into-summer look we all crave. I of course took this opportunity to quiz Lesley on her top beauty tips for this summer, these were her top tips . . . .
“For that fresh, bright-eyed look use Light Expert (light perfecting foundation brush) in Rosy Light. I love this under the eyes and tops of cheeks, as that natural, healthy highlight blends easily and makes you look like you’ve had eight hours sleep!”. Light Expert (£48) is available in 6 shades, click the brush and distribute ‘dots’ – concentrating on the centre of your face. Buff into skin from the centre – working outwards – to create a flawless, soft focus finish. Shade ‘Rosy Light’ can be used as a natural, sheer highlighter on the cheekbones, arch of the eyes and down the bridge of the nose. “For an extra pop of colour, add a bright liner around the lower lash line. A coloured mascara also works wonders to freshen up any eye! ‘Mystic Orchid’ or ‘Terryfic-Blue’ Terrybly Growth Boost Mascaras (£33.5) are winners and also condition and look after your lashes!”. I’ve been using Parti-Pris for a couple of weeks now and I love it. It’s quite a wet formula, going on easily with absolutely no clumps, giving me long, thick lashes with visible separation. No smudging or flaking and comes off easily. The colours are very pigmented and look great when added to the lower lash line for a subtle pop of colour. With its volume and length booster Lumicoat® Care technology, it activates growth and takes care of lashes one by one from the matrix to the tip. The restructuring formula is enriched with Hyaluronic Acid, Collagen and nutrient-wrapping plant protein to stimulate even the finest, most lifeless lashes. It’s too early for me to say that I’ve noticed an improvement in the condition of my lashes because of it , but looking at the reviews online we’re definitely on to a winner! I am personally also in love with the Sun Designer Palette £64 (Exclusive to SpaceNK) , it’s so perfect for summer and looks oh-so-gorgeous  it creates an all-over radiant and sun-kissed look on both fair and tanned complexions with bronzers, highlighters and blushers. The packaging is beautiful too! If you are in need of updating your makeup bag, then I can’t recommend By Terry and the expertise of the girls at Space NK highly enough – you will leave looking and feeling amazing. Book in with Ros at SpaceNK Edinburgh for a consultation (SpaceNK: 97-103 George Street, Edinburgh. 0131 225 6371). Also available throughout the UK, find your nearest store here. And while you’re there the lovely ladies at Jane Davidson (52 Thistle Street, Edinburgh. 0131 225 3280) are definitely worthwhile a visit, they will sort your whole Spring/Summer style out for you. Previous Post Got the holiday blues?